If you are looking for inspirational treadmill music videos but don’t like trying to catch programs on cable we’ve got a great idea for you. We found the best in treadmill workout music online so there’s no need to spend hours searching for energetic tunes, then spending all that time putting together different workouts. These are ready to go! Treadmill music videos come in two forms: those that demonstrate different workouts that you can do on the treadmill or other machines, and the type that are more travelogue and scenic entertainment in nature. In the latter kind, the video gives you a virtual tour of walking through lush Hawaiian forests and fields, trails in the Canadian Rockies, or the vistas in the Swiss Alps. Sounds inviting but these are the kinds of things you can find on cable TV. Run faster, farther, and longer with just 2 runs per week. Can be enjoyed outdoors or on the treadmill. Yuri Elkaim, Canada's top trainer, provides audio guided instruction and motivation alongside heart pumping running music. The best treadmill music videos we’ve found combine energetic music and fitness instruction. Music has always inspired and motivated people while they are walking and jogging, and this is needed even more when you’re indoors on a treadmill. The music makes the time go by quickly and keeps your spirits up. One of our favorite finds on the net has been Cardio Coach, an audio-guided workout program for any type of exercise machine. To lose weight on a treadmill, make sure you use it on a daily basis. This treadmill exercise video shows how to do it the right way. When beginning to run on a treadmill, start in small intervals. Video shows tips from a fitness instructor about proper treadmill exercise. When planning your treadmill workouts, increase the speed and inclination of the program according to your personal goals. Treadmill fitness videos show how. 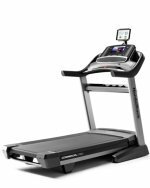 When choosing a treadmill, make sure it is meets certain specifications, such as user weight and length of running belt. Treadmills are an excellent way to train for marathon runners because the pace is regulated. Discover how to train for marathons in this treadmill video clip. The main difference between treadmills and elliptical trainers is the impact on joints. Discover the differences between treadmill workouts and elliptical machines. Cardio Coach offers downloadable treadmill workout music as well as CDs that can be played on any MP3 player and any music software. This is an incredibly popular website, currently streaming in over 90 countries around the world. The programs coach at four intensity levels: low, medium, moderate to high, and intense. Levels one and two are more aerobic in nature, while the upper level programs use advanced training methods to approach your anaerobic threshold, combined with outstanding music to help you burn fat and increase endurance. These programs will also show you how to read your machine’s heart rate monitor and how to get your own readout to approach 75%-90% of your maximum heart rate. Cardio Coach currently offers eight volumes of treadmill workout music, increasing in intensity levels with guest instructors and challenging workouts in a fast-paced yet highly entertaining training method. They can be applied to ellipticals, bikes, steppers and rowers as well. The sessions just fly by and you won’t believe the 40 minutes is over and you’re in the cool down period. As with any exercise, the harder you work the more calories you’ll burn but these workouts will inspire you to give it your all. But do such tools as treadmill music videos and downloaded music really motivate you to exercise? That would be an emphatic yes, because the music has a driving beat and the authoritative voice and enthusiasm of the instructor is absolutely addictive. You can listen to free samples of all the programs at the website, as well as read numerous customer comments as they share their treadmill settings for incline and resistance for each volume, as well as offer their own tips and encouragement.